A tornado destroyed my business. Now what? Joplin's 2011 tornado leveled John Motazedi's IT company, SNC². But the town's doctors couldn't operate without his services, so he kicked his recovery into high gear. No business owner is truly prepared for the chaos that comes with a natural disaster. In the weeks after a devastating storm, an entrepreneur must manage desperate employees, needy customers and hawkish vendors -- even if their workplace has been reduced to rubble. Small business owners in Oklahoma are facing that now. An EF5 tornado tore through the town of Moore on May 20, killing 24 and destroying nearly 5,000 buildings. They were still clearing the rubble Friday when another slew of twisters touched down just north of them, snaking through Oklahoma City and killing more than a dozen people. Business insurance plays a key role to funding a recovery. But as other storm survivors can attest, small businesses can't assume insurers will provide cash quickly. And even then, it's a fraction of the solution. 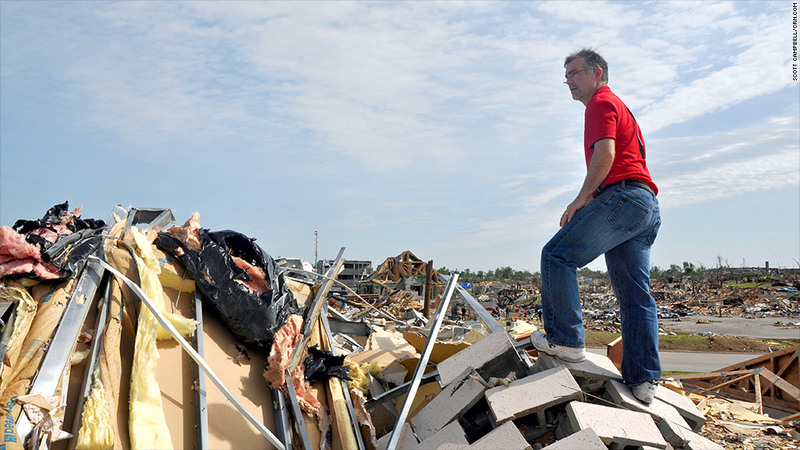 Lean on fellow entrepreneurs: Information technician John Motazedi's company, SNC², was annihilated by the 2011 multiple-vortex Joplin tornado. But he couldn't waste any time getting back on his feet. Close to 50 local physicians relied on Motazedi for computer services, and fierce winds had razed the town's medical district, leveling the doctors' offices when Joplin needed them most. Without access to digitized files, they couldn't properly care for hurt patients or verify prescriptions. Motazedi called for outside help: owners of similar IT companies in nearby states. Three executives showed up the next day. "You've got to bring people in to help you. You need people there to watch your back," Motazedi said. One CEO called suppliers and pleaded for emergency shipments of computer parts and software. Another managed cash flow. A third took on the role of Motazedi's administrative assistant. Together, they all managed the additional 20 engineers who showed up as volunteers. Also, Motazedi's usual 9-to-5 job became a 24-hour operation, one he couldn't handle alone. "I knew that in three days I was going to be worthless," he said. "I'd be too exhausted, sleepy, hungry to think right. People who don't sleep don't make good decisions. We could not screw up. It was people's lives, records." Stay connected: Jennifer Walzer's company was in a similar bind last year. BUMI helps companies salvage lost computer data. When Superstorm Sandy slammed New York last year, much of lower Manhattan remained without power for days. Several of her clients were knocked offline, but so was she. The bottom floors of her building were flooded by 35 feet of seawater. Crippled corporate clients had to rely on BUMI's eight scattered employees. Without asking, her operations manager immediately bought special mobile office phones and FedExed them to every employee's home. That initiative proved crucial, Walzer said. All were able to stay in touch, and it even allowed her company to field outside calls and gain new customers. Remember that business might take a back seat: In some cases, an entrepreneur's role in a community trumps business altogether. Mark Shuman was at Wal-Mart with his six-year-old daughter Sophia when the May 20 tornado barreled toward his Van's Pig Stands restaurant in Moore, Okla. Fearing for his two employees there -- including his 22-year-old daughter Samantha -- he ran outside to his white Ford F-250 pickup truck. Shuman drove as far as he could, but with debris blocking roads, he ditched the truck. He bolted for the restaurant a few blocks away with Sophia in his arms, covering her eyes to shield her from the carnage. Samantha and his store manager appeared in the distance. "We got the money!" she yelled. "I'm not worried about the money!" he told her. In actuality, he needs the cash badly. After paying $26,000 in payroll and bills this month, Shuman said there will only be $1,000 left in his bank account. All of his employees are now jobless, and two lost their homes. Instead of immediately starting to rebuild, the Shuman couple has focused on volunteering at church, serving food to Moore's tormented residents and consoling parents who lost their children. "It's been a rough week and a half," Shuman said last week. "We haven't been the ones really affected. The ones that were lost their houses, jobs, lives. We consider ourselves pretty blessed to have just lost the business."